Family camping in park. Summer outings & food safety. Bacteria will grow anywhere they have access to nutrients and water. Microorganisms that cause disease are called pathogens. When certain pathogens enter the food supply, they can cause foodborne illness. Under the right temperatures, between 40 and 140°F, bacteria reproduce rapidly. In some cases, they can double their numbers within 20 minutes. The warm temperature, along with the moisture needed for bacteria to flourish, makes the summer weather the perfect atmosphere for bacteria. That perfect weather, combined with an increase in outdoor activities, and food being prepared in outdoor areas that may lack the safety controls of a home kitchen, could be a recipe for disaster – leading family and friends to get sick. Never leave food out of refrigeration for more than two hours at room temperature. If the temperature is above 90°F, food should not be left out more than one hour. Keep hot food hot - at or above 140°F. Place cooked food in chafing dishes, preheated steam tables, warming trays or slow cookers. Keep cold food cold - at or below 40°F. Refrigerate or place food in containers on ice. If you’ve prepared large amounts of food, divide it into shallow containers. For example, a big pot of baked beans will take a long time to cool, inviting bacteria to multiply, and increasing the risk of foodborne illness. Instead, divide the food into smaller containers and place in the refrigerator or freezer promptly so it will cool quickly. If there are any doubts about how long the food was out, it is best to throw it out! 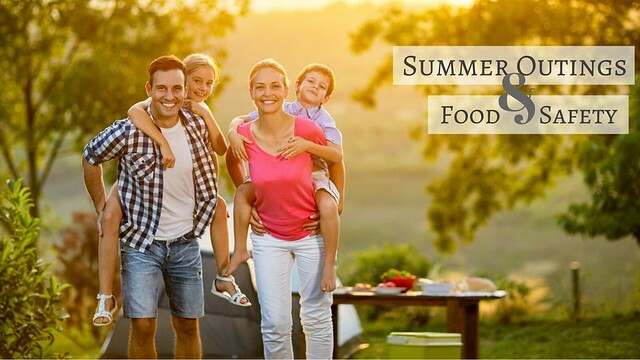 See more tips on being safe as foodborne illness peaks in the summer. If you have a question about meat, poultry or egg products, call the USDA Meat and Poultry Hotline by calling 1-888-MPHotline (1-888-674-6854) or email or chat via in English or Spanish via Ask Karen or Pregúntele a Karen. I found this article very interesting and informative! I would have loved to see additional information that was not mentioned. For example examples of "hot foods" and "cold foods" most susceptible to pathogenic bacteria, different health signs to look out for that indicates the food has been contaminated. Also curious on what was the most common method of contamination?? Improper handling or pathogens in the air? @Melissa C. - thank you for your comment. These are great questions. Any perishable item, regardless of being served hot or cold, is susceptible to bacterial growth when mishandled. Examples of perishable foods include meat, poultry, fish, dairy products, and all cooked foods. Symptoms of illness that comes from eating contaminated food may occur within minutes to weeks and often presents itself as flu-like symptoms, as the ill person may experience symptoms such as nausea, vomiting, diarrhea, or fever. The USDA’s Food Safety and Inspection Service (FSIS) recently completed an observational study in which participants were recorded cooking in a test kitchen to see if they handled food unsafely while cooking. Preliminary results interestingly show that participants made these top five food safety mistakes: go.usa.gov/xmBT7. We hope this helps!